As some colonists were already contemplating separation from Britain, they began to prepare new state constitutions to replace the old colonial charters. The first colony to organize as a state was New Hampshire in January 1776. By 1780, all the other former colonies followed New Hampshire’s lead and created their own constitutions, or written plans for government. Each state had a legislature to create laws and most were bicameral, or had two parts or houses. This concept came from the example of the English Parliament. Each state had a governor elected by the legislature or the citizens. Each state had judges and courts to interpret the laws. There was a bill of rights in most constitutions, guaranteeing certain basic freedoms and legal protections. Many of the rights and freedoms found in these bills of rights have their foundation in the Magna Carta and the English Bill of Rights. Massachusetts didn’t set up a constitution until 1780. There is something that might be said about being last, as this constitution is still in use today. Massachusetts spread power more evenly among the three branches; legislature, governor, and courts. Other states gave more power to the legislatures. Massachusetts gave the governor and courts the power to check the legislature. The state’s constitution was created by an elected special convention of delegates, not the legislature. The citizens then voted their approval of the document. Our nation’s founding fathers looked at the constitution of Massachusetts as a model in their creation of the U.S. Constitution. But first, the states joined together under the Articles of Confederation as the governmental framework. Each state existed with much independence, taking care of most of the basic needs of daily life. They were aware, though, that there was some things that they had a tough time doing. For instance, a small state like New Hampshire or Rhode Island was no match for a foreign attacker in a war. They realized that there needed to be a corporate, national authority to provide for all people militarily. This would be important as they considered the inevitable war with Great Britain. The Second Continental Congress decided that they should make plans for a union of the states. That union would be made fact with the Articles of Confederation in 1777. The Articles of Confederation was basically the first constitution of this nation. What exactly is a confederation? Does it have something to do with Civil War? A confederation is a group of individuals or individual state governments who band together for a common purpose. The Articles of Confederation established a league of friendship among the independent states. Unlike our current bicameral Congress, the Articles of Confederation set up a unicameral, or one-house legislature and gave each state one vote. This unicameral legislature had sole control of the military and authority to deal with foreign countries. This is about where that power seemed to end. Colonists didn’t like the exertion of power that the British legislature had over them when they were colonies. They did not want any branch of government to be too powerful, so they restricted the powers of the legislature. The power to enforce laws and the power to tax were not given to this group. Congress could ask the states for money but could not demand it. Anything the Congress wanted to do had to have the states’ blessing. The Articles of Confederation were ratified, or approved, by all 13 states by 1781. They were quick to discover the problems with this policy. Congress needed nine states to vote in favor of a bill for it to become law. Any effort to amend, or change, the Articles needed all 13 states to vote in favor. With policies such as these, it was hard for Congress to ever get a law passed. Congress couldn’t even enforce the laws they did get passed. The Articles did not provide for an executive or judicial branch and states had greater power than the national government. States could ignore a law if they so desired and Congress was hindered for doing anything about it. Even with the problems and class struggles with the Articles of Confederation, the United States won their war against Great Britain. They would use some of the problems of the Articles of Confederation to lead to a new form of government. The country was encountering very difficult financial issues because the government could not tax the people. And with the cost of the Revolutionary War, the government had borrowed money to pay those expenses. The intensive debt of the individual state governments meant that they would tax their citizens to a higher degree. The state governments seemed to be “tax-happy,” even taxing goods from other states and foreign countries. This hurt trade and caused many farmers to go out of business. The feelings of farmers because of these concerns would ultimately be felt throughout the states. Riots broke out in several states in 1786 and 1787. A Massachusetts farmer and former soldier, Daniel Shays knew the bite of debt from the taxes placed on his farm. The state proceeded to threaten seizure of Shays’ farm for back taxes, an experience encountered by many farmers in several states. Shays did not believe the state should punish him for their own doing (enacting the tax). A lot of other people agreed with Shays. He led close to 1,200 Massachusetts farmers in an armed uprising on a federal arsenal. 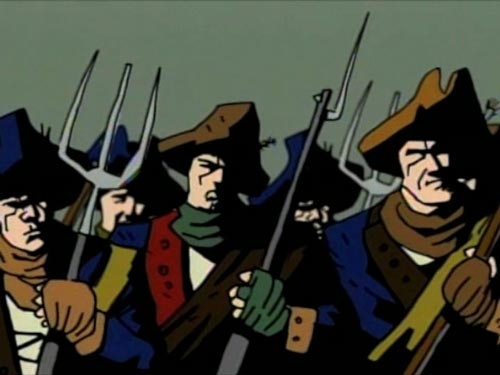 Shays’ Rebellion, as the event was known, was quickly squelched, but caused the nation to take notice of the need for a stronger national government. Twelve states sent delegates to a 1787 meeting in Philadelphia to revise the Articles of Confederation. What these delegates did instead remains an integral part of our lives today.